Discover the last true monarchy in Africa on this all-encompassing adventure through Swaziland. The country offers travellers the chance toreally get under the skin of Africa and marvel at its culture and natural beauty. On this trip we get up close and personal with rhino in Mkhaya National Park, explore tranquil Mlilwane as zebras and nyala pass us by and drive up to Execution Rock for sundowners and incredible views. We join our trip in Johannesburg where you will meet your Explore Leader and then we will make our way to the Kingdom of Swaziland. A scenic journey which takes us from the low plains of South Africa to the mountainous Highveld of Swaziland. Nestled between South Africa and Mozambique, Swaziland has somehow kept its independence and maintained its traditions and culture with the King leading the country as the last true monarch in the world; to the casual observer it would seem unchanged for centuries. However as we will find over the next 8 days, the country has been a leading light in conservation in Southern Africa. Our base for the next two nights are log cabins in the Malolotja Nature Reserve, one of the most impressive mountain parks in Southern Africa. We will have some time for an orientation walk after arriving. This morning we explore this beautiful nature reserve, we start by making our way through the park to the Malolotja Falls; at 95m they are the highest waterfalls in Swaziland. Whilst hiking across the green rolling hills your leader will be spotting some of abundant bird life found in the park, including endangered blue swallow, Denham's bustard and southern bald ibis. After lunch the afternoon is free for you to continue the exploration of the reserve and your leader will advise you of many short walking trails found in the area. For the thrill seekers there is the option of taking the famous Malolotja Canopy Tour, featuring 11 wooden platforms joined together by zip lines, an unforgettable experience. There is also an option to take a short excursion to the ancient Sangweni San Rock Art site just outside the reserve near Maguga Dam. We spend our last morning in the Highveld visiting the Lion Cavern, the oldest mine in the world. This iron ore mine has been dated by archaeologists to around 43000 years ago and we will have a tour with a local guide. From the mine we visit the Ngwenya Glass Blowing Factory where highly skilled artists blow amazing glass crafts which are for sale in the factory shop. This is an important site as the glass used is 100% recycled and collected from used glass bottles in Swaziland. Leaving the green mountains behind us, we make our way to the renowned Mlilwane Wildlife Sanctuary. Mlilwane is where conservation started in Swaziland and we will spend the afternoon on a walking safari through this beautiful park, looking for zebra, antelope, wildebeest and a myriad of birdlife. The morning is free for you to choose how you would like to explore Mlilwane, by foot, by bike or by horseback. All are available and offer unique ways of viewing game or just enjoying the beautiful countryside. Of course you can also just relax in our traditional beehive huts if you desire. In the afternoon we will take a game drive around the park and as the sun starts to go down we will head up the iconic Execution Rock, the mountain that dominates the landscape. Legend has it that centuries ago those who committed serious crimes against the King would be hauled to this peak and thrown from the cliff edge to their death. The summit offers 360 degree views of the entire Ezulwini Valley and is a great way to end the day - for us at least! Leaving Mlilwane we stop at local craft markets and have a chance to either buy or just see what the local communities make and sell. 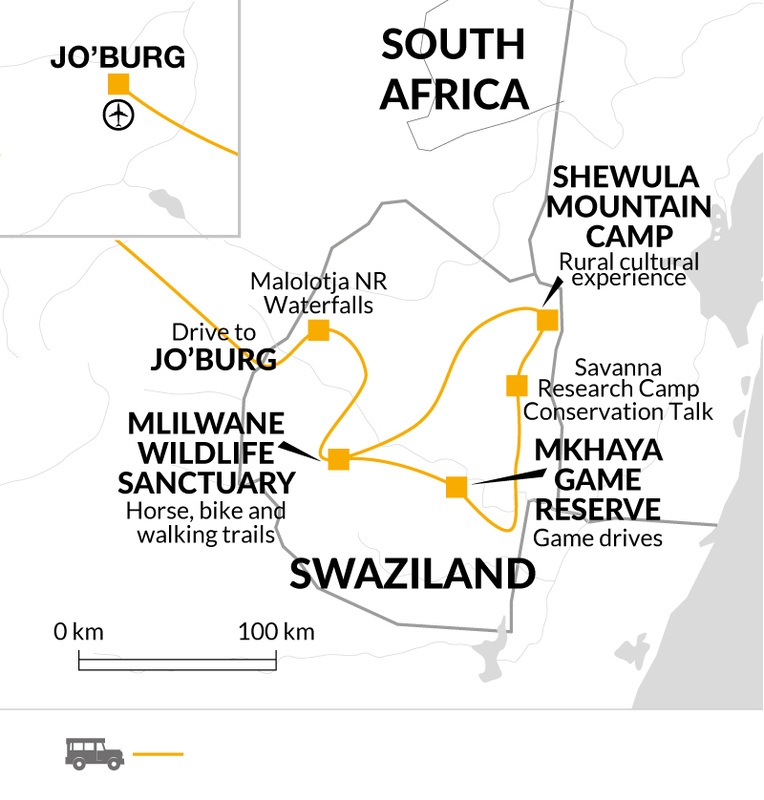 This area is famous for its candle making and we will visit a local workshop before heading to the Savanna Research Camp in Mbuluzi Game Reserve. At the camp we will have a conservation talk with a local specialist, understanding the history of nature conservation in Swaziland and the challenges facing the country and its wildlife today. We then make our way up the Lubombo ridge to the Shewula Mountain community to stay with our hosts for the evening. Swaziland is famous for its pristine culture and this is a fantastic way to experience this and enjoy the company of the local community. At Shewula Mountain Camp we will have the opportunity to sample delicious traditional Swazi cuisine including "tinkuku" a kind of casserole and "mgomeni" a delicious Swazi bean dish. We will also try some of the locally home brewed sorghum beer that is popular in the area. This morning we will have some time to wander through the local village on a guided tour and meet some more of the community and see their homes and livelihoods. We will also visit a traditional herbalist doctor, known locally as Sangoma. We then journey south to Mkhaya Game Reserve. Well known for it's black and white rhino population, the reserve is also home to buffalo and leopard along with many of southern Africa's endangered and rare wildlife including sable and roan antelope, tsesebe and eland. We will take a game drive in the hope of spotting some of these animals before arriving at our lodge where we spend the next two nights. We are up early today and out game driving in open top land rovers, hoping to spot hyena, giraffe, hippo, kudu and many more. There is also an abundance of birdlife to find here, including narina trogon, pink-throated twinspot and nightjars. During the late morning we will join park rangers on a guided walking safari giving us the opportunity to be out of the vehicle, on foot and appreciating the Swazi bushveld and its wildlife from a more intimate perspective. After relaxing after lunch we will head out again this afternoon on safari in this private reserve. There is also a "hide" at our lodge, which we can try out tonight to get more great sightings of rhino and other game. This morning is our final safari of the trip before we make our way back to Johannesburg airport where the trip ends. Above prices are advised in the the South African Rand. Bring a torch, water bottle, sunhatunscreen and insect repellent. Binoculars are essential for game viewing and a 300mm lens is recommended for photography. Walking poles are recommended for some of the hikes. Mosquito nets are not required as the accommodation provides screening where necessary. Accordingly, you should allow £15.00 per person for group tipping. Please note that at some of the cabins we use in the national parks in Swaziland share a bathroom between two cabins.